Adopt a word. Save our language. Click on a word, and you are invited to “adopt” it. If you make the commitment, you “hereby promise to use this word, in conversation and correspondence, as frequently as possible to the best of [your] ability.” Enter your username and password, and you are now the proud adoptive parent of a wayward word. After adopting, you are also encouraged to buy a t-shirt with your word of choice. 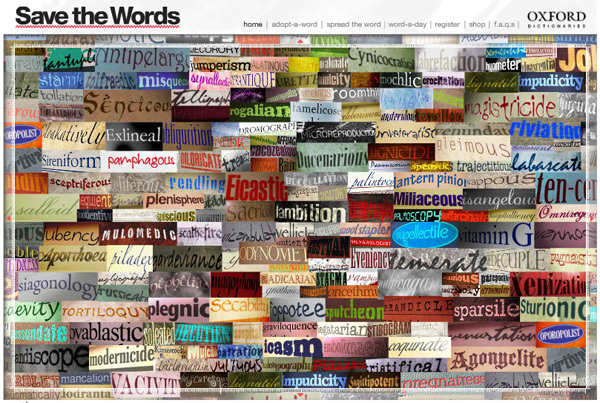 Savethewords.org is the brain-child of advertising executive Edward Ong. Ong’s agency, Young and Rubicam, based in Kuala Lampur, Malaysia, was hired by the Oxford English Dictionary to promote the print version of its dictionary. Both the OED and Young and Rubicam hope that interest in the obscure words, not found in the online version of the OED, will promote sales of its traditional print version. So, what are you waiting for? A periantique word just might give you cause for some good blateration at your next cocktail party.